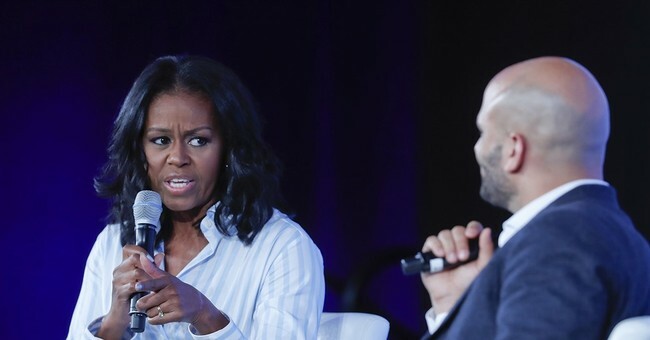 Speaking during a conference in Boston yesterday, former First Lady Michelle Obama berated women who dared to vote against Hillary Clinton and for Donald Trump. She also implied women who voted for Trump are incapable of thinking for themselves or making their own decisions. "As far as I'm concerned, any woman who voted against Hillary Clinton voted against their own voice in a way. To me, it doesn’t say as much about Hillary ? and everybody’s trying to wonder. Well, what does it mean for Hillary? No, no, no. What does it mean for us as women? That we look at those two candidates, as women, and many of us said, ‘That guy. He’s better for me. His voice is more true to me.’ Well, to me that just says you don’t like your voice. You like the thing we’re told to like," she said. First of all, lets do a rewind. Did women who voted for Barack Obama over Hillary Clinton in the 2008 Democrat primary "vote against their voice" because they voted against the female candidate? Did Michelle Obama vote against her voice for voting for a man, her husband, instead of Hillary? Feminism is supposed to be about women acting as individuals, thinking for themselves, making decisions that best benefit them and intellectual diversity. Voting for a candidate based on gender doesn't fit. Michelle Obama should know better. Second, it wasn't until Hillary Clinton became the last and best hope to preserve President Obama's legacy that Michelle Obama actually started praising her. In fact, in 2008 Michelle Obama argued Clinton was unqualified to sit in the Oval Office. "One of the important aspects of this race is modeling what good families should look like and my view is if you can't run your own house, you certainly can't run the White House. Can't do it," she said about Clinton during a 2008 campaign event. Finally, it turns out there are millions of women -- particularly in the Midwest where Clinton failed to campaign -- who believe economic prosperity and growth are far more important than propping up identity politics. At a time when the Democrat Party needs all the votes it can get, berating women in defense of the decade's biggest loser isn't a good look.